Although Ivan Aguéli is best known to readers of this blog as the proto-Traditionalist who introduced Guénon to Sufism (and was also instrumental in introducing the French public to Ibn Arabi), he is still best known in his native Sweden as a painter. The Museum of Art in Gothenburg, Sweden's second city, is currently exhibiting six of his works, all small format, as part of its permanent exhibition of "Nordic art at the turn of the century." 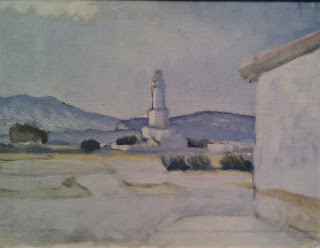 Pride of place is given to "Landscape with tower" (shown above, left), which may be an imaginary landscape, as there is something of the minaret about the tower. 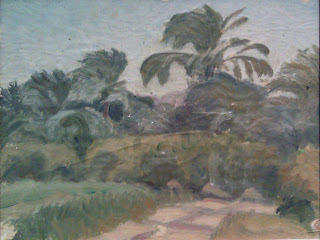 Then comes "Palm grove," which is probably an Egyptian scene, and some European landscapes (not shown here). The same exhibition also has a large oil by Prince Eugen, the member of the Swedish royal family whose grant to the exiled Aguéli in Barcelona arrived too late, after Aguéli's death. It was Prince Eugeen who then took charge of and preserved Aguéli's paintings, some of which were acquired by the Gothenburg museum in 1920. For a Swedish painter to go to Paris at the end of the nineteenth century was not unusual. 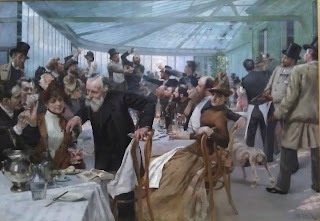 The museum also has a large oil of the Scandinavian Artists' Lunch at the Café Ledoyen, evidently an annual event. This lunch was in 1886, and the painting does not include Aguéli, who had then only just arrived in Paris. 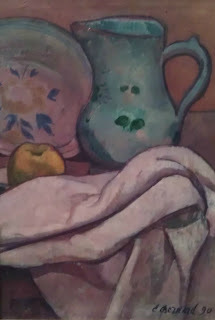 Finally, the museum also has an oil by Emile Bernard, the French painter in whose studio Aguéli at one point worked in Paris, who is said also to have had an interest in esotericism and in Egypt, though I have not confirmed this. One can see the influence of Bernard on some of Aguéli's other paintings, though not those in the Gothenburg museum or in this blog post. My thanks to Göran Larsson and Henrik Bogdan of the University of Gothenburg whose invitation to lecture in Gothenburg (on "Sufism as Western esotericism") is what led to my visit to the Museum of Art there. 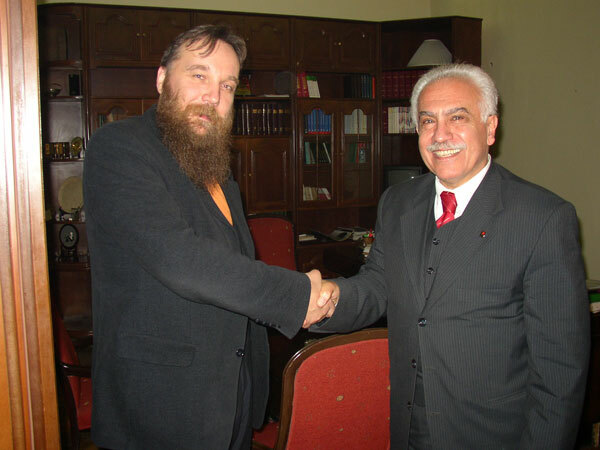 A new article covers Dugin's Turkish contacts, with Doğu Perinçek and his İşçi Partisi (IP, Workers' Party). The article is by Martin Riexinger, "'Turkey, Completely Independent!' Contemporary Turkish left-wing Nationalism (ulusal sol/ulusalcilik): its Predecessors, Objectives and Enemies," Oriente Moderno 90, no. 2, pp. 353-95. Riexinger explains that IP is one of two major organizations on the Turkish nationalist left. It generally receives few votes in elections, but its importance comes not from its electoral activities, but from the fact that it--like Türk Solu, the other major left nationalist group--draws its support from "members of the army, the bureaucracy, the academe and the professions." Thus for the Eurasia Conference it organized in 2004 it attracted the support of Süleyman Demirel and the presence of diplomats from the Turkic republics, China and Iran, as well as of the former head of the National Security Council, General Tuncer Kılınç. The IP was established out of the Sosyalist Parti in 1992 by Perinçek, formerly the leader of the Türkiye İhtilalcı İşçi ve Köylü Partisi (Revolutionary Workers' and Farmers' Party of Turkey), and before that a Maoist student leader. The IP's leftism now consists primarily in the use of some Marxist terminology and a "keen interest in workers' and farmers' protests" (despite its middle-class membership), and its nationalism consists primarily in its stance against the threats that the US-dominated New World Order allegedly pose to Turkish independence, and thus also in opposition to the EU. In this Perinçek needs allies, and this is the basis of his relationship with Dugin, whose stand against the US and globalization Perinçek shares and supports. The IP is generally anti-religious, seeing religion as reactionary, and drawing on European post-Feuerbachian criticism of religions. It thus has no interest in Dugin's Traditionalism, which in Turkey is associated with the Nakşibendis and the Nurcus, the latter of whom are among the religious groups that the IP attacks. It also attacks the Islamists, Christian missionaries, and the Gülen movement, which emphasizes dialog with non-Muslims. Given the rapprochement between nationalist right and nationalist left that has already taken place, however, Riexinger considers that a future rapprochement between the nationalist left and some Islamists is not impossible, given that they both share the same enemies--the EU, the USA, missionaries, Jews, Freemasons, and homosexuals--and "subordinate the individual to the collective and ... cannot imagine something more horrible than a culturally heterogenous Turkey." An interesting detail: Russian nationalists have generally been supporters of their fellow-Orthodox Greeks. Dugin, however, has supported Turkey rather than Greece in Cyprus, which has the important consequence of making him acceptable to Turkish nationalists, on the grounds that the Greeks are a maritime (and so an Atlantic) civilization rather than a Eurasian one. Dugin and "occult dissident culture"
A new article of mine on Dugin: Mark Sedgwick, “Occult Dissident Culture: The Case of Aleksandr Dugin.” In The New Age of Russia: Occult and Esoteric Dimensions, Birgit Menzel, Michael Hagemeister and Bernice Glatzer Rosenthal, ed.s (Munich: Otto Sagner, 2011), pp. 273-92. The article argues that "A form of Traditionalism that is both distinctively Soviet and distinctively Russian ... lies at the heart of Dugin’s politics. This form of Traditionalism is, in important ways, a continuation into the post-Soviet era of one aspect of Soviet civilization, occult dissident culture."